Welcome to the web page of department of Space Sciences and Technologies. 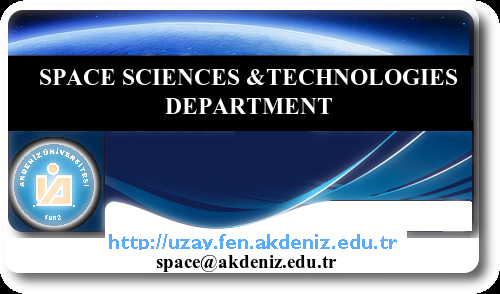 The Department of Space Sciences and Technologies at the Akdeniz University is located on the first floor of the Science Faculty building (Fen Fakultesi). The Department's assosication with TUBITAK National Observatory provides excellent opportunities in Optical astronomy. Interdisciplinary work between the departments of Physics and Space Science and Techologies is planned. Astrometry from the ground and space allows us to explore the Solar System objects and improve our knowledge of the dynamical and physical characteristics of these objects. The GAIA mission of the European Space Agency which is scheduled for launch in 2013 will cover a large space astrometric program that will improve our knowledge of a huge number of astrophysical and Solar system objects (e.g. asteroids, comets, planetary satellites) by performing a systematic survey of the whole sky (V~20). Nevertheless ground-based observation by a follow-up program will be useful and will allow us to validate some difficult detection by the probe or to avoid the loss of some newly detected objects. Regarding the impressive improvement of the orbit accuracy which will be reached, a fundamental step in astrometry will be done and new challenges will arrive in this domain as well for the space observation and their interpretation as for the ground-based observation. At the present time, astrometrists work for the preparation of this important mission but we must think about a long term vision which will ensure the necessary manpower for the analysis of the huge amount of data and the future researches in the astrometry domain. Despite this enthusiastic future, astrometry is not included in curriculum of several countries, therefore students and young astronomers must be encouraged to reinforce the astrometric community active in astrometry. In this international context, a summer school could be an interesting way to foster young students and astronomers for this specialization. The summer school is performed in the frame of an International Joint Project (IJP) of French, Turkish, Russian, Ukrainian, and Chinese collaboration . In following the summer school, we also organize a workshop as a continuation of future activities established by the IJP to initiate data exploitation on astrometric observations by candidate/professional scientists. Official language of the summer school and the workshop is English. The workshop "Astrometry now and in the future" is organized in the continuation of the "Summer School on Astrometry in Antalya" and is devoted to discussions of present and future activities in the astrometry domain from ground-based and space observations. Ground-based observations and space observations are complementary and this synergy can be very useful to explore some domains. This is the case for example for the dynamics of the Solar System Objects. The development of observing networks, the advent of next generation telescopes, and the next space missions will lead to an increase of data with valuable astrometric measurements. A long term vision which will ensure the manpower for the analysis of the huge amount of data and the future researches in the astrometry domain is necessary. Students and young astronomers must be encouraged to reinforce the astrometric community active in astrometry. In this international context, a workshop is an interesting way to foster young students and astronomers for this specialization. Given the above expectations, we organize this workshop on astrometry in Antalya to initiate this future plan and data exploitation on astrometric observations by candidate/professional scientists. The workshop consists of oral contributions (at most 20 mın. Each + 5 min. For discussion), complemented by optional posters.